If desired, crush cereal by placing in resealable food-storage plastic bag; seal bag and crush with rolling pin or meat mallet (or crush in food processor). In medium bowl, beat egg with wire whisk or fork. Beat in buttermilk, oil and cereal; let stand about 5 minutes or until cereal is softened. Beat in remaining ingredients except blueberries. Gently stir in 1/2 cup (125 mL) blueberries. Heat griddle or skillet over medium heat or to 375°F. Grease griddle with vegetable oil if necessary (or spray with cooking spray before heating). 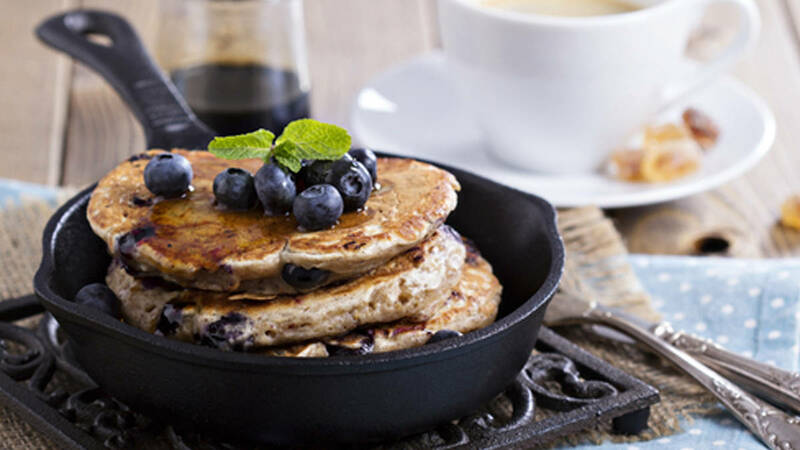 For each pancake, pour 1/4 cup (50 mL) batter onto hot griddle (if batter is too thick, stir in additional milk, 1 tablespoon/15 mL at a time, until as thin as desired). Cook pancakes until puffed and full of bubbles but before bubbles break. Turn; cook other sides until golden brown. Serve topped with blueberries and/or strawberries.